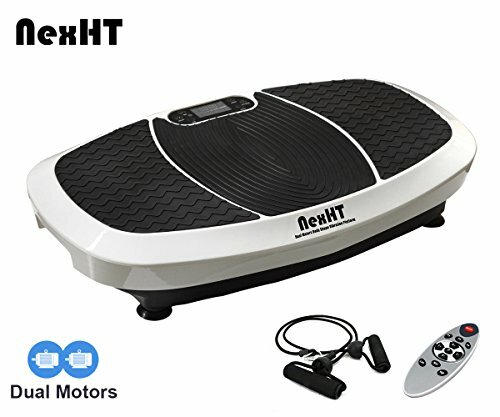 Features This body shape vibration platform provides you with a new and exciting way to train! Take your fitness to the high level. Dual Oscillating Motors(Motors Power:200W + 200W ),Three Vibration types: 1.Horizontal vibration, Up-down, Amplitude: 0-12mm, Frequency: 0Hz-30Hz; 2.Left-right Oscillation :Amplitude: 0-12mm, Frequency: 0-30Hz. 3. 3D oscillation movements: Left-right & Up-down, more powerful and comfortable compare to the single motor. And the big LCD display, ensure clear reading. Platform and Workout Trainer. Use it as a step trainer or push-up top. It's perfect for sports training, accelerate weight loss and burn fat. Improve muscle strength, flexibility and circulation. It allows you to tone your abdominal muscle ,thighs, buttocks, calves and more . With Remote controller and two resistance bands. Technical Specifications: Power: Dual Motors Consumption: 200W and 200W Voltage: 110V Frequency: 50~60/Hz Vibrations Type: Triangular oscillation, Tri-Planer Vibrations Amplitude: 0~0.4inch Speed range: 1-180levels User Weight Capability: 330lbs Materials: ABS IRON Units Dimension: 31.5*18.1*5.3inch Units Weight: 39.6lbs Safety Considerations: Recommended time is 10-20min every day If you suffer from joint problems, have a hypertension, bronchitis, heart condition or skin disease, diabetes, or other diseases, or pregnancy, extreme obesity, middle ear infection, bone weaknesses, or use a pacemaker, we recommend seeking medical advice before using this vibration trainer. Study the functions and make sure you know how to operate the machine to avoid malfunction or injury. Keep children away from this machine. It is a normal reaction for a new user may have a headache if don’t use it correctly. Variants of Speed Range and Strong body shape Massage Vibration. Perfect for muscle toning, muscle building, weight loss & cellulite reduction. Small compact size - can be used anywhere at home & easy to put away. Design with big LCD display, ensure clear reading and easy adjustment. Comes with Arm cords, Remote control ,Resistance Bands and Instruction manual.